Hey Michael! Come and get your Nomad! Here’s the latest iteration of my Nomad shape, a.k.a. egg, speed egg. This is the epoxy/EPS version, which was glassed with 4oz+6oz S-cloth (deck) and 6oz S-cloth bottom. Board is about a 2lbs lighter than a standard PU/PE shape. Boards dimensions are 7’6″ 16-1/8″x22-1/2″x15-1/4″ 2-7/8″ 53.7L. This shape has an interesting story behind it, and it demonstrates how my shapes evolve over time. Earlier this year I hand-shaped an 8-0 EPS King Fish for a customer, and then had the same shape cut by machine, using EPS again. I use the AKU program for machining my blanks and since AKU doesn’t cut swallow or fish-tails, the tailblock of the cut blank is left straight. Since personally, I’m not a big fan of big fish shapes, I decided to just re-shape the tail into a round-pin. Thus was born the 7-11 Egg which I really enjoyed last spring. But, I felt the shape in EPS was a little to floaty for my weight, so I sold the 7-11 to Mike G., and hand-shaped a 7-6 from PU foam that was much more to my liking. 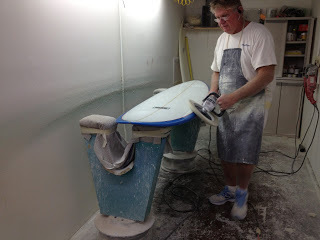 About 5 weeks ago, Michael stopped by and turns out he works and surfs with Mike G. He had ridden the 7-11 and wanted something similar, but smaller. So, I loaned him the 7-6 for a week or so, and after riding it, he felt the shape was still not quite right. So we narrowed the outline, and reduced the thickness and went with EPS foam to maximize float, and here is the final product. And that’s how my shapes evolve; a combination of personal trial and error, coupled with feedback from customers. Don’t forget, you can get a custom shape for the same price as a board off the rack. All it takes is about 4 weeks of patience.